Having read a good amount of science fiction, China Miéville is one of those authors who I’ve always been tangentially aware of, his books always at the fringes of my awareness, never quite seeming to capture my attention at the right time, but the interesting covers always beckoning every time I went looking for something new. Perhaps part of the reason for my intentional distance is the fact that his work often eludes simple description and slips between genre and classification, never really settling neatly in one category or another, where I had always gravitated toward genre fiction specifically because of its generally more rigid categorizations, something I’ve only recently began to really approach differently. Brief research reveals that Miéville’s work actually falls into a more recent literary movement known as the New Weird, a term I hated almost as soon as I learned of its existence, partially for sounding so dismissive and off-putting, like a term that was invented just to have someone sneer at you, “Oh, you’re one of those New Weird nerds?” And partially because it does exactly what Miéville seems reaching to avoid: easy classification. It’s also particularly problematic for describing The City and The City, which isn’t exactly new or weird. 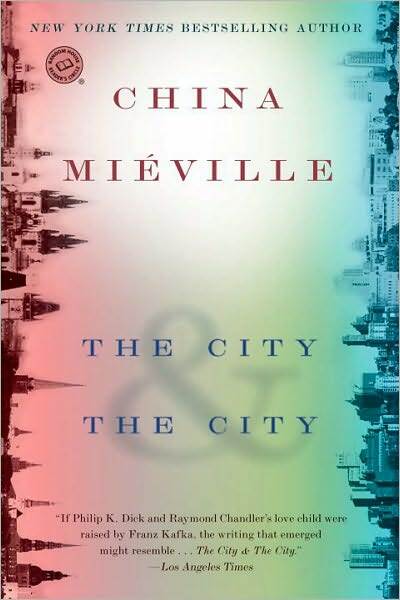 Admittedly, Miéville’s The City and The City may be the author at his most accessible, telling what is, in essence, a completely traditional detective story. Inspector Tyrador Borlu is a veteran detective of the Extreme Crimes division in the fictional European city of Beszel, which is less a stand-in for any particular city than it is an amalgamation of many. The case involves the murder of a young woman, a student with foreign ties and, of course, too much information. You’ve seen all of this before: the beleaguered and lonely veteran detective, the case he can’t shake, the flirty-but-chaste relationship with a young female sidekick, the old city in decline, the many red herrings, corruption waiting inside every sinister shadow and echoed footstep. Its European setting does give it some marked differences from American noir, but the tones and rhythms are all familiar. What makes The City and The City different, however, is its fascinating central conceit: Beszel actually occupies the same geographical space as another city known as Ul Qoma. Its citizens do not interact or acknowledge one another, even if they are inches apart, and the borderlines are well-known by both sides and never crossed. This segregation is enforced on both populations by the Orwellian Federal agency known only as Breach. To be clear, the divide between the populations is not some kind of dimensional rift or portal –there’s no fantasy or magic-realism at work here- it’s entirely self-imposed. While this is obviously meant as an allegory for different existing prejudices and societal segregations (cultural, class, religion, etc. ), watching Miéville put it into practice, with strict and well thought-out laws and regulations, yields captivating results. It’s possible, for instance, for an American to get a connecting flight directly to Beszel, but if one wants to reach Ul Qoma directly, they’d have better luck departing from Canada. And how do officials react, for instance, when a bomb goes off and it’s not entirely clear to rescue workers which city a victim belongs to? As you can probably guess, these lines will be tested and crossed at varying intervals as the case grows in complexity, forcing Borlu to interact with both Breach and his Ul Qoma counterparts, which requires a special passport. It’s these smaller details, like the bureaucracy surrounding the acquisition of one of these passports, or the way these laws and protocols are embedded into the story and its characters without ever feeling like Miéville is pulling us aside to explain the rules, that give the idea all the weight it needs to be convincing. In many ways, the structure of the traditional detective narrative, which often deals strongly in rigid procedural codes and themes, such as the suspicion of corrupted oversight, is the ideal construct for both this story and its imaginative central conceit. Ulimately, however, this central premise is probably the only thing that will really stick with you. As interesting as it can be, it’s still a detective novel, and your own interest in the story will likely stretch only so far as your interest in the genre. And, like most detective stories, you will probably find the details and specifics, even most of the characters, begin to fade from memory as soon as you finish, most of them blending into the other vaguely recalled detective stories you’ve already read, the only thing standing out is the strange premise at the novel’s core, which you might recall to someone the same way you would when describing a half-remembered dream.